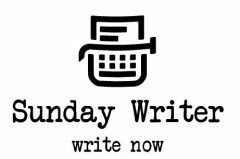 What is a Sunday Writer? You are creative but not making your living from your creativity. You have a job or a family or caring responsibilities, and you exercise your creativity in the corners of your days. You write or paint on Sundays, or early mornings or late at night, or knit or crochet while you’re waiting for an appointment, or sing and dance when no-one is looking. This site is about how you can incorporate more of your creativity into your everyday life, how you can bring your creativity into whatever you are doing, and – if you want to – how you can take your creativity forward.